According to the Belgian Federal Agency Economy about 4.5 million tonnes of vegetable waste is produced annually. This is a great potential source for the cultivation of the black soldier fly. This can easily convert residual waste of arable land, catering, supermarket and convert to useful manure, animal proteins. The larvae of the black soldier fly is a real omnivore with huge appetite. The larvae devours waste problem-free. The larvae is also growing extremely fast. If they get energy rich foods the just budded larvae can be harvested after just two weeks. If a human would grow as quickly after two weeks of its birth it weighs as much as a humpback whale! 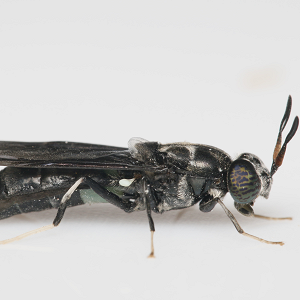 The black soldier fly has a high calcium content. That is good for bones and eggs, and so it is currently mainly used as feed for pets. But also from the aquaculture and poultry sectors, there is a growing interest. Inagro is growing the fly for several years now on a small scale. Thanks to our new breeding cells we can now take a flying start and let our infrastructure grow to a real pilot installation. 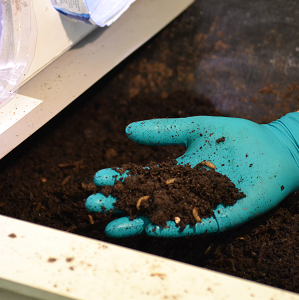 Two climate rooms are now fully dedicated to the cultivation of black soldier fly. We can accurately determine the climate and run experiments. With this installation we want to optimize the cultivation of the fly and use residual waste as good as possible. The research of Inagro focuses on the optimization of the cultivation and that the conditions of the residual streams are as efficient as possible. * What are the optimal conditions for the flies to breed and to obtain a maximum number of offspring? * What are the optimal conditions to the maggots grow fast? * What waste streams (or combinations of residual flows) are suitable as feed and what processing is required (for example schredding or fermenting)? * Can we optimize the system with the least amount of resources to obtain maximum yield? In our quest for the ideal feed composition for our insects we use different crop residues at the site of Inagro. The Horticulture Department gave us, for example, chicory roots, tomato stems and vegetables that are not suitable for auction. Thanks to the Department of Agriculture we could test the yield of mixed crops, in particular a combination of triticale with field beans or peas. The mountain of waste is so reduced by our insects. 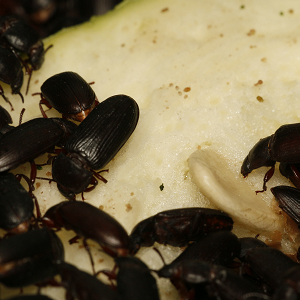 In addition, also the reverse is on our schedule: the processing of the waste flows from our insects breeding.